This entry was posted on Monday, March 17th, 2014 at 1:48 pm and is filed under DNA. You can follow any responses to this entry through the RSS 2.0 feed. You can leave a response, or trackback from your own site. Just remember: those percentages, given the limits of today’s science, are cocktail party conversation pieces and nothing more. 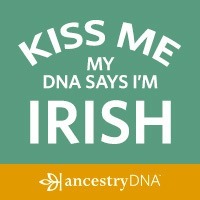 Your Irish could be Scottish, or English (or vice versa)! We have a long way to go before those percentages mean anything reliable. There is a story here, some where, that I need to find. Actually, probably more stories. So far, the DNA hints have not gotten me anywhere either. But, as you say, “We have a long way to go”. 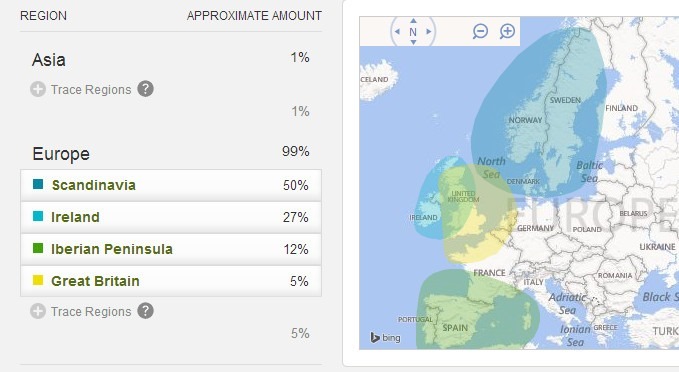 Regards to your DNA & the Iberian Peninsula & Ireland connection(s). Some of that Iberian Peninsula/Ireland connection could be because many of the Spanish Armada ships were blown off course and wrecked on the Irish coast. They intermingled with the ‘native’ Irish, many of whom had Viking ancestry. This could be where some of your ancestors picked up those lines of DNA. Of course, the DNA sample is only as good as the lab doing the testing. I don’t know anything about that, but have other people had the same kind of weird results? Thank you for that information and your comment.